Every year we make New Year’s resolutions, only to break them. Why not keep at least one of them? 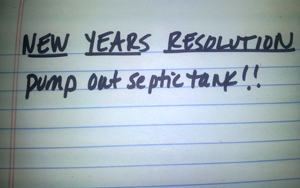 Here’s an easy one to put on your list: pump out your septic tank! I know, I know. That’s probably isn’t the first thing on your list, or even on the list at all. But that’s the danger: too many homeowners forget about important things if they aren’t urgent. Don’t keep putting it off. Just because it’s out of sight, doesn’t mean it should be out of mind. Your toilet may still flush, but each time you flush it, you are adding more matter to your septic tank. That matter needs to be removed periodically to prevent clogging up your drainfield. Once your drainfield clogs, pumping the tank does not remedy the problem. Often, an entirely new system is required. This isn’t one of those resolutions that require a lot of effort…all you have to do is pick up the phone and schedule! If your septic tank hasn’t been cleaned within the last 3 to 5 years, give Van Delden a call for a free phone quote: (210)698.2000 in San Antonio or (830)249.4000 in Boerne.